Vardhangad fort is one of those which has witnessed the stay of Chhatrapati Shivaji Maharaj. 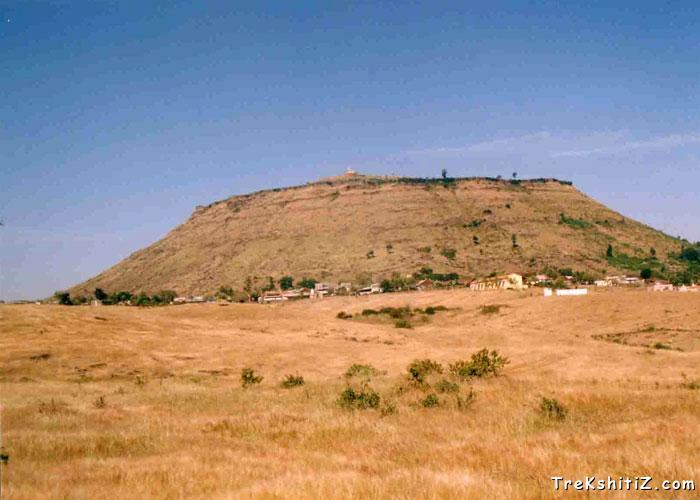 This fort is located on the Mahadev hill range, border of Koregaon Khatav taluka on the junction of Bhandlikundal, 7 miles from Koregaon and 17 miles North East of Satara. The fort was vulnerable to attacks from the adjacent hills of Lalgun and Rameshwar. There is a well-known temple of Goddess Vardhanimata on the fort and is visited frequently by the villagers. The entrance of this fort is facing eastwards and is built in the Gomukhi architectural style. To the left of the entrance there is a flag post and next to it is a secret chamber built in the fortification wall. We see a small raised hill when we enter the fort. Steps are built for access to it. On the way there is a dilapidated idol Lord Hanuman and a Lord Shiva temple and a water tank besides it. It takes about 15 minutes to reach here. On this hill there is a temple of Goddess Vardhanimata. There is a platform in front this temple. The temple hall is big. Descend the hill from behind the temple where we can find water tank to the right. It takes about one hour to visit the entire fort. Vardhangad can be approached from Satara and Phaltan. 1) Vardhangad village is 30 kms from Satara on the Satara-Pandharpur route. 2) Phaltan-Molghat-Pusegaon (total 41 kms) � Vardhangad village(7 kms). 3) Phaltan-Dahiwadi-Pusegaon (total 45 kms) � Vardhangad village(7 kms). The entrance of the village is welcomed by two canons at its gates. The fortification wall of the fort which is still in a good shape can be clearly visible from the base itself. It takes half an hour to reach the fort entrance from the base. १)	On satara-Pandharpur road there are forts of Kalyangad(Nandgiri), Vardhangad and Mahimangad. Start overnight from Mumbai/Pune to reach Kalyangad fort in early morning then proceed to Vardhangad and Mahimangad and head back via Phaltan. These three forts can be visited in one day with proper planning. २) Information on Kalyangad(Nandgiri), Vardhangad, Mahimangad is available on our website.